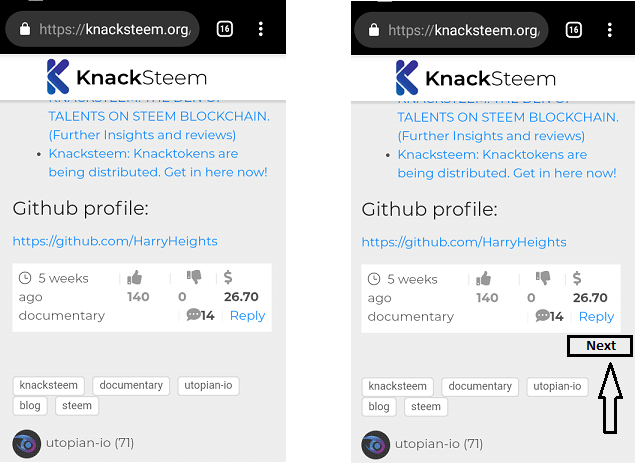 Knacksteem is a Steem based project for talented people. The project allows every individual to showcase what they can do. As well as reward people for their effort. This suggestion post will center around the flexibility of the project. To read posts on almost every dapp on steem, it requires some basic and manual method. 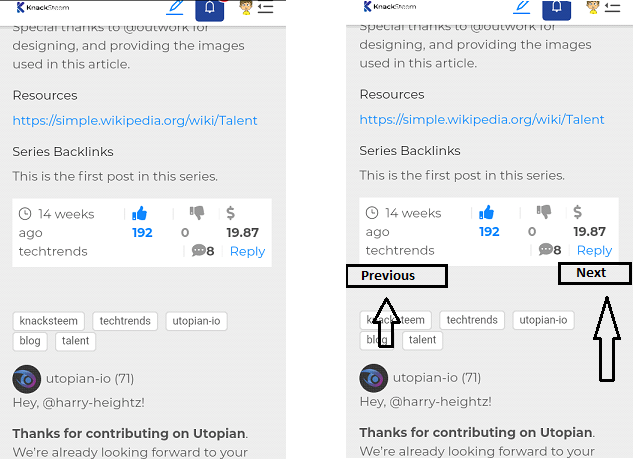 As a user of knacksteem, if I decide to read a post by another user and I navigate to the user URL, usually all post will be aligned from old to new, which I can quickly click on anyone I want to read. However, when I decide to read more than one post, I will continue to use the back button to switch to the next blog, which I see as manual navigation. My suggestion is about adding a feature that will avoid or Improve this aspect of knacksteem. The idea is simple but very effective. There will be a NEXT button on every blog post which will work to take readers to the next blog by the same author if initiated on the author's page. However, if I started outside the author's page, places like the timeline(Hot page) it will show the next post down to the one the person is contently on. The mock up below shows a clear picture of the idea. The picture above is about when a reader finishes reading a post, and he/she decide to learn more. This one shows the ability to next and goes back to the previous post. This is indeed a feature to save time and effort. I have never seen any platform on Steen that works like this, but I am confident that the implementation is feasible. It will help users to navigate within the platform flexible. There won't be a need for unnecessary using of back button when readers have the intention of reading continually. It's a feature to enhance the project and make it more enjoyable. That's for now. Thanks for reading. Moreover, I would love to see this feature in future improvement. Hello @darewealth,thank you for your contribution. First of all i would like to say that the feature you have suggested is a great example to increase the efficiency of the project. Adding next and previous buttons is a great idea that will have good impact on user interface.However,this idea is a kind of a basic feature that will not have a huge impact on the project,thank you. Thank you for your review, @sinem006! Keep up the good work!